Camping Le Ruisseau des Pyrénées is located in the Basque village of Bidart, near Biarritz. Thanks to the ideal location of the camping you can discover the charm of the Basque country and make a trip to Spain. Beautiful beaches and downtown Bidart are located just 2.5 km from the campsite. 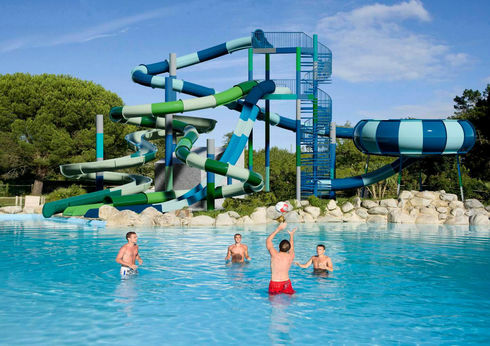 The campsite offers a beautiful pool area with 1 outdoor pool, 1 indoor heated pool with a whirlpool, 5 waterslides and 1 paddling pool for the little ones! Bidart is an authentic Basquea village next to the ocean and at the foot of the Pyrenees. 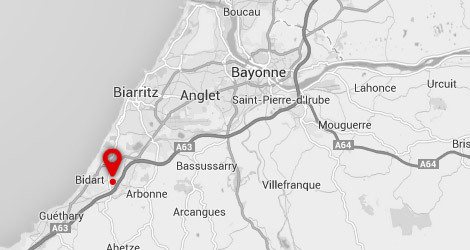 Nearby are Bayonne, Saint Jean de Luz, Biarritz, Anglet, several mountain villages and Spain, all worth a visit. You can of course also enjoy the ocean and go surfing at one of the many great surf spots. There is a water park with: 1 pool, 1 paddling pool, 5 water slides. Spa/fitness area with: water trail, indoor heated pool, sauna and fitness (entry fee in July and August). 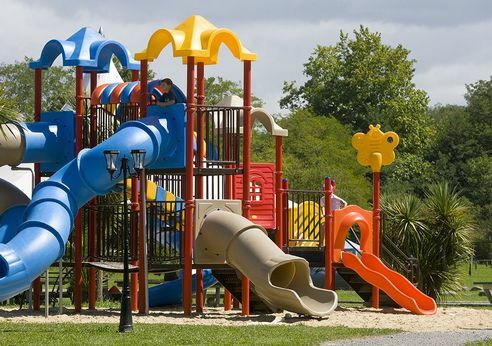 Free of charge for children under 7 years old. Children under 12 years old must be accompanied by an adult! Pass Espace Detente in July and August: unlimited access to the indoor pool, balneo therapy, fitness, sauna and hammam for 25€/week/person. - Kids club: for children aged 4 to 12. From 10am to 12pm. - For children aged 12 and older: sport tournaments from 2.30pm to 6pm. Kids farm. From 9pm to 11pm: evening animation (concert, karaoke, disco, bingo,..). Activities in July and August: kids club, sport tournaments and evening activities. Our sport areas (football, rugby, volleyball, tennis, basketball fields, ping pong, mini golf,..) are open! Tree Climbing Trails on campsite: 3 different trails and a big zip-line (entry fee). Swimming lessons in July and August (participation fee). Surf school in association with the local club in July and August (participation fee). Water park with slides. Laundry (washing machine and dryer, iron and ironing board). - Magazines / newspapers - Wifi coverage on the whole site - Communal barbecues - Deposit: €160 - Tourist tax: €0.66/person. Payable upon arrival and only in cash. - Wifi (€3 to €32, depending on the duration of the selected package) Other: - Pets tattooed/chipped and vaccinated allowed: 1 pet per accommodation (free except from July 01 to September 02, 2017, then €15 /week), vaccination book / pet passport required. Dogs in category 1 and 2 prohibited. - No TV rental possible - Individual gas barbecues permitted (charcoal and electric NOT allowed) - Only one vehicle is allowed (for any additional cars there is a parking lot outside the campsite) - Access to the campsite by car is not possible after 23h. - Putting up tents next to a mobile home is not allowed. To visit in the area: - Biarritz: Sea Museum, the "Rocher de la Vierge," introduction to surfing ... - Saint Jean de Luz, the "Maison de l'Infante", the Church of St. John the Baptist, the Tuna Festival ... - And of course the "ferias" in Bayonne and Pamplona (Spain)! Le camping est coupe par une route , l eau de la piscine est glacée , la balneo payante !!! le ménage pas fait a l heure ou nous devions récupérer notre hébergement , nous pensions réserver dans un capfun et non pas dans un partenaire . c très mal explique . déçue sur toute la ligne !!!!!! !